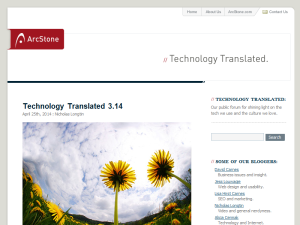 This what your Technology Translated Blog Ad will look like to visitors! Of course you will want to use keywords and ad targeting to get the most out of your ad campaign! So purchase an ad space today before there all gone! Yes! Spring is almost here – what an amazingly long winter we’re having in MN. Aye carrumba! Here’s an idea. Make a cup of tea. Take comfort that it’s almost over. Then curl-up and read the March edition of Tech Translated. See me in my selfie-style video debut! I thought I’d post a video of a practice run I did while preparing for a 5-minute presentation I gave recently at a conference in Florida. Trust me, the content is good and I’ve found the SCARF model to be very helpful in both my professional and personal life. In this blog post I unpack a Neil Gaiman quote that I think is important for anyone trying to stay caught up with the Internet and technology in general. Please comment on this post if you have any tricks or tips for staying up to date and evolving as a professional. The best comment will receive a shout-out and fabulous prize. What a great idea. We all have our phones with us most of the time anyway, why not make the case carry more? For the cost of a typical case ($45) you also get a tweezer, scissor, two screw drivers, a nail file, toothpick, two pens and a kickstand – all neatly tucked into an iPhone case of the usual size. If you don’t subscribe to the Marketing Profs web site and are involved with digital marketing, you’re missing out. This is a great resource with timely information about online marketing. It’s direct, practical and well-written. This cool new technology provides a reader app that will allow you to speed read, with excellent retention and comprehension, about 600-1000 words per minute with minimal practice. It’s actually kind of fun – check it out on their web site and see how fast you can read out of the shoot. We’ve curated a lovely Valentine’s box of snackable wisdom for this month’s edition of Tech Translated. Ever wanted to be on TV? HitRECord is a production company with an interesting web site led by Joseph Gordon-Levitt. The idea is that you upload any creative content – videos, songs, artwork, photos, poetry, etc. and other HitRECord members can add to them, remix them and morph them. The best pieces are taken and edited into a TV show that you can watch on the Pivot network. If any of the work is used in a money making endeavor, the profits are split 50/50 with the artists whose work was used. Crowdsourced art – an interesting concept / experiment. I’ve posted some artsy content of my own to try it out – maybe someday I’ll be a star! What’s the difference between a Google Doodle and a Golden Doodle? How about a $30,000 scholarship and an additional grant of $50,000 for your child’s (or niece, cousin’s, etc.) school? If you know any creative kids between kindergarten and 12th grade (which to my mind is most kids), encourage them to enter Google’s contest to create a Google doodle. What’s a Google doodle? Occasionally Google changes its home page graphic logo to mark a special occasion or to honor an important person. This contest was created to get kids to imagine what the future could be like and answer the question, “If you could invent one thing to make the world a better place, what would it be?” Learn more about it in Lisa’s blog post here. This is a fascinating new website that enables you to find top content and top influencers on just about any topic. Great for recruiting bloggers or finding out what’s currently hot in your industry. A quick search enables you to find out what content and which people are getting the most likes, follows, etc. It’s free right now while it’s in beta – very well done and highly reccomended. In honor of Valentine’s day, Richart chocolates is offering special chocolate blends inspired by three French love poems (included in the box). Lisa and I visited this chocolatier when we were in Paris a few years ago, I don’t think you can go wrong with a box of these for your sweetie. Bon appétit, ma amour! Last week, David and I attended the annual luncheon for our friendly neighbors, Domestic Abuse Project (DAP). For over 30 years, DAP has worked with women and men to curb domestic violence. Their ability to combine immediate crisis response with long-term care and behavioral therapy made them the first of their kind in Minnesota. With over 500 in attendance, speakers told heartfelt stories of DAP’s success as healers and teachers. Earlier in the summer, ArcStone began working to donate a newly designed, SEO-friendly website that will provide resources for domestic abuse victims and raise awareness about their organization. Our designers and developers have gone to great lengths to create something special for DAP. WordPress 3.x has been incorporated into the site so that DAP staff can economically (and oh-so-easily) keep content up-to-date. Laying the groundwork for DAP’s first ever SEO campaign will ensure higher visibility on the search engines. Direction over rich media placement will result in the site’s audience being better engaged. Needless to say, I am very proud of my colleagues for taking the time to give back to the local community. Site launch is a scheduled for just a few weeks from now. In the meantime, we wait in eager anticipation. To learn more about Minneapolis-based Domestic Abuse Project, visit www.domesticabuseproject.com. If you would make a donation, please visit this website. It’s sad to see a trusted and talented employee leave your business. I received notice last week that Nik Rowell, TechTranslated contributor, friend and fellow ArcStonian will be leaving us to work for the social e-commerce start-up Alvenda (which I have to say seems to be a pretty cool business). Thank you Nik for all the fantastic work you have done here at ArcStone. Time and again you have made us proud – you’ll always have friends here. For the last few years, John Rowell has carried around a business card that reads “John Rowell, retired. No phone. No Fax. No email. No Worries” … No joke, he really printed a handful of those out. In no way does this mean he’s been spending retirement fishing and playing the StarTribune’s daily Sudoku. Well – those are both pretty accurate – but much of John’s retired days are spent sawing, varnishing and wood-burning away at his lake home in Outing, MN. This has become the studio of Nature Enhanced, John’s creative outlet for all wood products. Handmade. It was time to replace the old clip-art logo with a fresh, logo that played off of the wood theme and the fact that all products are branded, literally, with “HANDCRAFTED BY JOHN E. ROWELL“. The cards were printed on 13pt, Uncoated 2″ x 2″ cards, using UPrinting. They were designed to double as a product hang tag, and each was given a hole punch and a string. I decided that the cards also needed to embody the ‘Handcrafted’ theme of company. To accomplish this, I first gathered sticks during a late night stroll along Nicollet Island. The sticks were then broken into approximately 2″ pieces and laboriously super glued to the bottom of the cards. I prepared about 100 of these to get my Dad started, and gave him a hole-punch, string and super glue to finish the remaining 400 on days that Sudoku only takes him a few minutes. HOME – a very brief intro to the company. CONTACT – Office and studio info and a simple contact form. I also set up a basic admin area that walks through accessing the new nature-enhanced.com email accounts, working with the online store, and cut-and-paste code to allow using the Nature Enhanced logo on Craigslist ads and other websites. Using white foam board, masking tape and some flood lights, I created a makeshift photo lightbox to allow for isolated product photography. I set up a Free account at Big Cartel to get John started with an online store. The free account allows for 5 products, 1 photo per product and basic stats. The Big Cartel admin area is very well designed and easy to work with – and, because they allow for custom CSS on all accounts, I was able to fully style the store to match the look of the Nature Enhanced website. Hopefully all of this was worth the 5 year wait… In fact, I hope it’s so good that John has to fire up that phone, fax and email a bit more often. Thank you, thank you, thank you … your business and support enable us to do what we love. We’re looking forward to another great year of Service, Craftsmanship, Evolution and Happiness. Season’s Greetings from all of us at ArcStone! If you are the owner of Technology Translated, or someone who enjoys this blog why not upgrade it to a Featured Listing or Permanent Listing?